Nusirat Aderinsola Sadiku was born at Ikare Akoko, in Ondo State, Nigeria on 15th September, 1979. She attended Government College, Ikere Ekiti, between 1991 and 1996. Sadiku was admitted to study Forestry and Wood Technology at the Federal University of Technology Akure, and graduated with a Second Class Honours (Upper Division) in 2006. She subsequently had her M. Tech. (Wood Technology) in 2012 and PhD in Wood Science from Federal University of Technology Akure effective 19th August, 2016. Nusirat Aderinsola Sadiku was employed as a Graduate Assistant in 2011 and rose to the rank of Lecturer II by 2016. 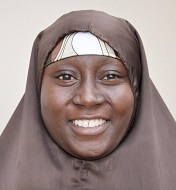 Being one of the Fellows of African Women in Agricultural Research and Development, Nusirat Aderinsola Sadiku underwent Mentoring and Leadership Skill Programme Organized by African Women in Agricultural Research and Development in 2011 and 2012 at the World Agroforestry Centre, Kenya. She was also involved in an Institution based Research project which entails investigating the Properties of Bamboo to promote its utilization in Nigeria. The research was funded from the Tertiary Education Trust Fund (TETFund) in 2014. She was recently granted Ron Cockcroft African Travel Grant Award to Attend International Research Group on Wood Protection 49th Conference in Johannesburg, South Africa in April, 2018.